For more stability and driving comfort. With adjustable rebound damping. Sporty drivers who want more than just an outstanding look and lowering within the TÜV-tested adjustment range, will find the perfect suspension solution with the KW coilovers Variant 2 "inox-line". Unlimited individuality for performance & comfort. Damping adjustment separately for rebound & compression. 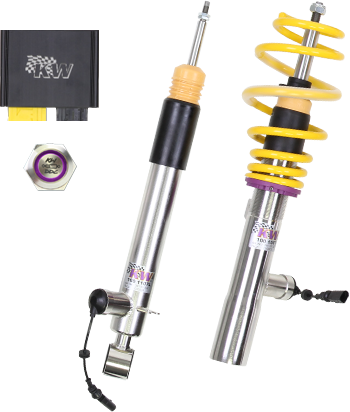 If you have already made the first performance modifications to your sporty street vehicle, KW coilovers Variant 3 can further enhance your performance with our targeted damper settings. The patented KW-valve technology for the separate adjustment of rebound and compression damping allows you to individually adapt the vehicle-specific basic setup. Independent adjustable rebound and compression damping for Street, highway, long distances, tuning, show and sport use with street tires. Available in two variants. As a Plug & Play solution with operation via the serial button in the interior or as DDC ECU retrofit solution with operation via retrofit button or iPhone, iPod or iPad App. Experience innovation and quality "Made in Germany": the KW DDC (Dynamic Damping Control) coilovers with ECU (Electronic Control Unit). 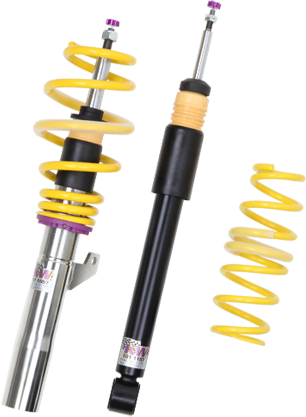 The coilovers with its electronically controlled dampers enable an intelligent suspension setup via App-control and it is already available for numerous vehicles without adaptive series suspension. Street, highway, long distances, tuning, show and sport use with street tires. lift kit, your vehicle can be hydraulically lifted either at the front axle or on both axles by up to 45 mm. KW Street Comfort coilovers, for your comfort-oriented driving pleasure. In case your series suspension or upgarded suspension kit is too hard for you in your everyday life, KW Street Comfort sport suspension is the perfect solution for more driving comfort. It combines lowering within the vehicle-specific adjustment range of 10 to 40 mm with a comfort-oriented damper setup developed from KW test engineers in numerous test runs in everyday life and on our KW 7-post rig. KW Clubsport coilovers transfer motorsport technology to the street. 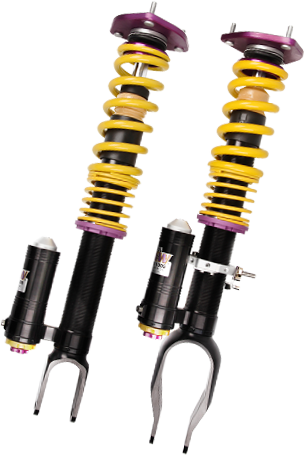 The KW Clubsport coilovers with their uncompromising combination of high-end racing technology with maintenance-free KW OEM components and TÜV certificate. This will give you the perfect accessory to take full potential of your sports car at track days, sport driver courses, tourist rides on Grand Prix courses and on the Nürburgring Nordschleife. The racing program KW Competition was designed for national and international motor sports. 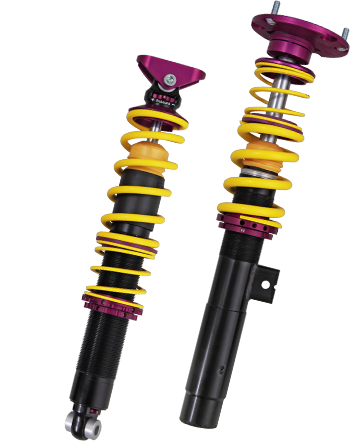 Competition racing coilovers in two damping versions for amateur sport and international use in top motor sport. From the series production, MINI Challenge, up to individual solutions for the FIA GT 1, GT 3, WTCC with innovative setup from the KW 7post rig.